2019-01-28 My D-STAR system seems to be working well. I've had a number of QSOs with interesting people both here in the US and elsewhere. Seems there is almost always someone somewhere on one of the reflectors. Still a lot I don't know about it, but so far it's been a fun addition to my ham shack. It's fun to work one mode a while, like CW, then switch to SSB and then to D-STAR, and of course our local repeater or even 2 meter direct with a neighbor not too far away. 2019-01-19 Pictured above is the box my Zumspot-rpi came in, my "new" IC7100 and the Zumspot in operation. I put the Philmore box behind it to show the contrast in radio technology from the 1940s or so to 2019! The Zumspot is in a plastic case sold on Amazon, custom made for this model of the Raspberry Pi with the Zumspot module with the attached 1.3 inch OLED display. Building the case is a bit involved but turns out nicely. My friend Gary, KD9KHI, has been pestering me to get "into" D-STAR. I have to say I wasn't all that interested as I've been kind of a "purist", touting the infrastructure-less wonders of point-to-point ham radio. 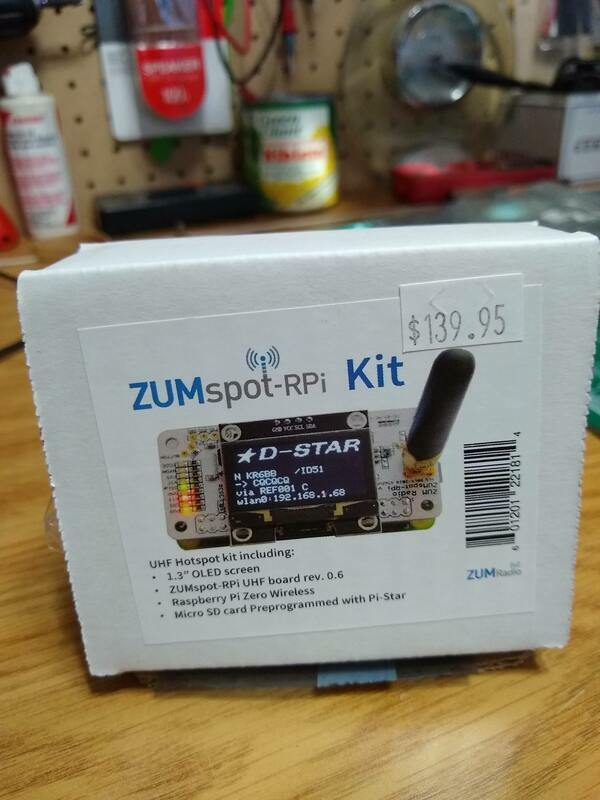 But after visiting our local HRO in Milwaukee last week with him I found myself coming home with the ZUMspot-rpi kit! The ZUMspot is certainly a cute little thing. I, along with Gary, needed (or more honestly, wanted) them because we are on the fringe of all of the nearby D-star repeaters in our area. Until Just a couple weeks ago the whole idea was irrelevant for me as I owned no D-STAR compatible radios. 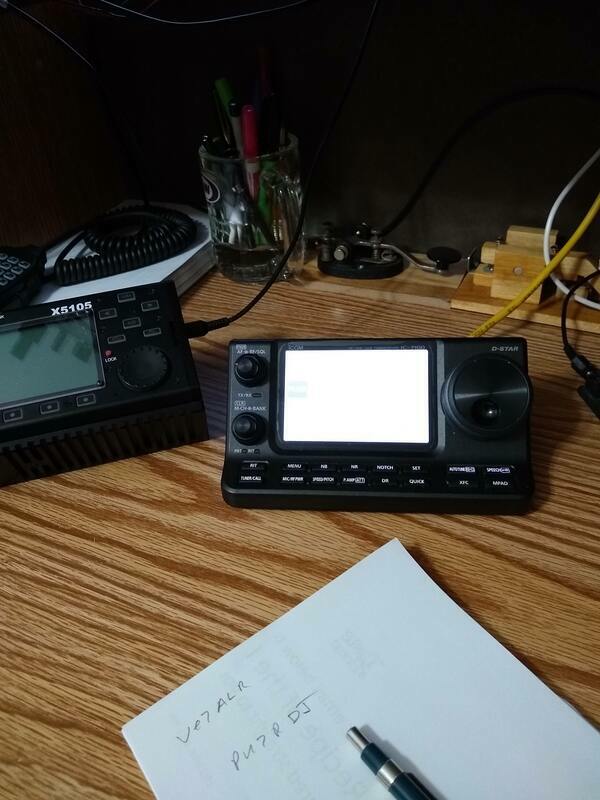 Then I traded for an Icom IC-7100 which has D-STAR integrated into it. A previous owner had apparently done a full reset so I had to download the factory setup file from the Icom website. Installing it in the radio was pretty easy as I simply copied the file onto an SD Card, inserted it into the radio and loaded it. Bingo everything was there! Then I went through the somewhat tedious and very precise setup of the radio and the ZUMspot-rpi and finally got everything going. Took about a day and a half, likely mostly because I didn't read either manual thoroughly! But it's all working now. 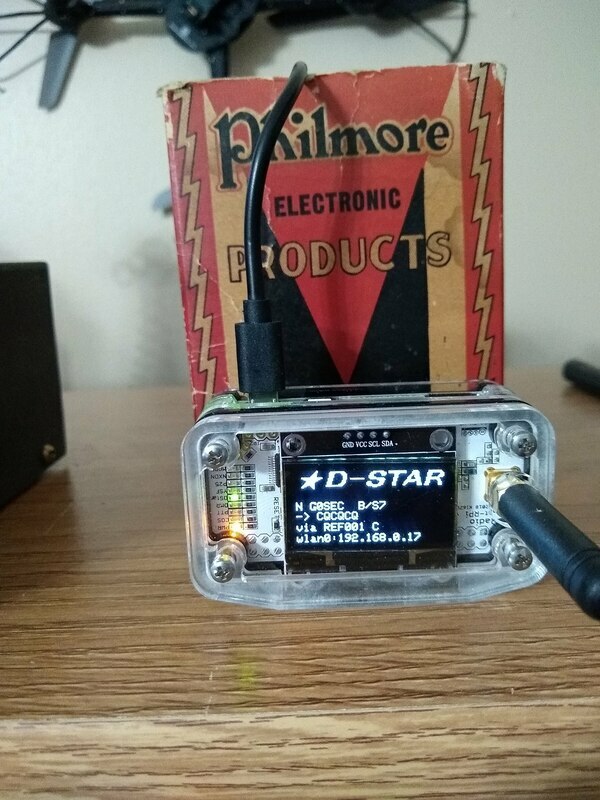 Having played with D-STAR for just a few days I can see how it becomes "addicting," providing instant access to a world-wide pool of hams just waiting for their radio to talk to them. My second contact was with a station in New Zealand. Over my entire 60 years in ham radio, I had logged only one HF QSO with someone there! I'm not promoting abandoning traditional point-to-point, radio-to-radio ham radio. My favorite mode is still HF CW with a straight key, made even more challenging and fun at five watts or less. And my shack contains several rigs dating from the 40s to the 60s, most of which work. And I dink around with HF antennas quite a bit, just completing my first ever small magnetic loop. But D-STAR and probably the other digital modes are fun and certainly challenge one's technical acumen. They also provide us hams with one more way to be in touch with fellow hams to learn from and enjoy interactng with each other. Just one more of the many aspects of our hobby to keep us motivated, challenged and NOT BORED. What's next? 2019-01-22 Yesterday my D-STAR setup started acting up. The indication was garbled and choppy audio. I was sure it was "my problem" so started playing around with settings of both my radio and the ZUMspot. Of course I messed everything up, but thanks to my friend Gary I got the settings back to where the radio and ZUMspot were talking with each other. Things seemed fine but then, listening to a conversation between a station in Florida and one in Korea I noticed some chopping again and then the two of them began noticing and talking about it. The guy in Florida was convinced it was a problem on his end. But I realized it was bigger than that. My friend, Gary, was noticing the same thing. Clearly the D-STAR network was having problems. Then it hit me, the Internet and all the infrastructure of D-STAR is to internet based digital communications what propagation is to HF! It's all part of the game.